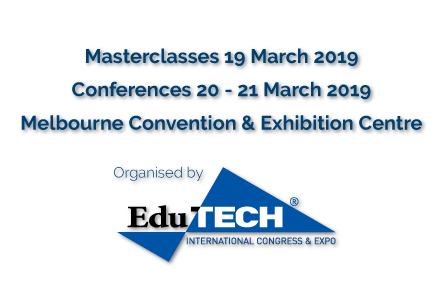 There are 6 parallel full day conferences running from 20 - 21 March 2019. Your pass only allows entry to the conference you selected during registration. There are 6 pre-event full day masterclasses running on the 19 March 2019. The BUNDLE or MASTERCLASS package allows entry to the masterclass you selected during registration. Seating capacity is limited in workshop and roundtable sessions. Preferences selected before the event are located on the back of your name badge but please arrive early in order to secure a seat. If a roundtable has reached capacity you are more than welcome to stand around the table. For all sponsors, exhibitors and expo visitors, there is a visitors cafe on the expo floor for you to purchase food and beverage. Delegates with dietary requirements who requested a special meal at the time of registration, should ask venue staff where these will be served during meal breaks. During the Gala Dinner, make yourself known to the table wait staff. The drinks reception will be held on 20 March from 5:00pm - 7:00pm in the Exhibition Hall. All delegates, speakers and exhibitors are welcome to attend. To keep up to date with the latest agendas, competitions and to interact with other attendees download the mobile app. Just search 'Terrapinn Events' in the App Store or Google Play store. This will be available 6 weeks prior to the event, you will receive an email with your login details. Sponsors and exhibitors will be conducting prize draws over the two day event. To find out what’s on offer or take a stroll around the exhibition hall for your chance to win some great prizes. Help Terrapinn Australia improve our future events. Please complete the post-event survey that will be emailed to you as the event. We welcome all types of feedback and strive to improve our events each year.